"Dmitry Donskoy" is followed by the Northern Fleet's tug "Nikolay Chiker". The world's largest nuclear-powered submarine on northbound voyage outside the coast of Norway. UPDATE Sunday August 6: The submarine is now followed by Norwegian Coast Guard vessel “KV Bergen”. West of Bremanger around noon. Returning from Naval Parade in St. Petersburg, the two largest nuclear powered vessels of the Russian Northern Fleet are again sailing near Norwegian waters. 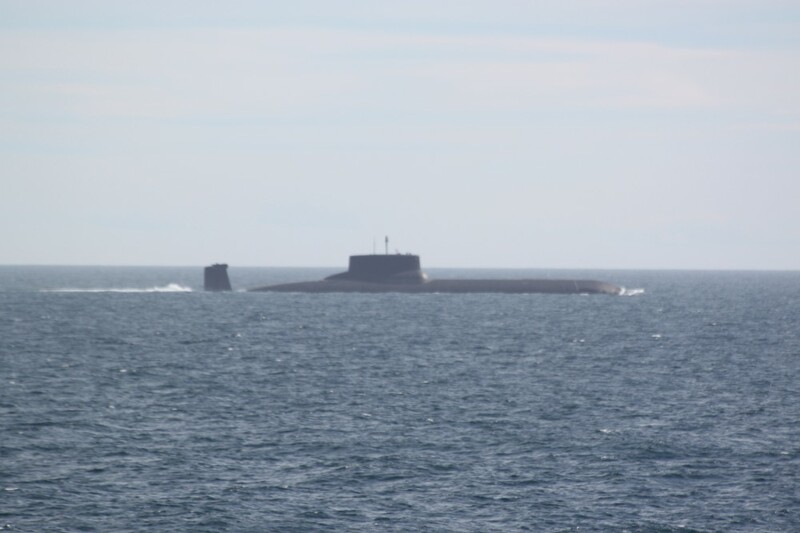 «Dmitry Donskoy» normally serves as a test-bed for Russian ballistic missiles of the Bulava-type and has Severodvinsk in the White Sea as homeport. This July, the sub participated in the Naval Day Parade in St. Petersburg together with several other warships from Severomorsk on Russia’s Barents Sea coast, including the nuclear-powered battle cruiser «Pyotr Velikiy». Like other military vessels, neither «Dmitry Donskoy» nor «Pyotr Velikiy» are sailing with their automatic identification system (AIS) turned on. It is, however, possible to track the voyage by following the Northern Fleet’s tug «Nikolay Chiker» that sails together with «Pyotr Velikiy». MarineTraffic is one service available for tracking the voyage. Saturday before noon, the vessles were sailing in the North Sea outside the Norwegian city of Stavanger sailing at a speed of 12 knots. Depending on how far out from the coast the submarine sails, the voyage is expected to be in Norwegian waters for until Tuesday or Wednesday next week before sailing into Russian sector of the Barents Sea. En route south, «Dmitry Donskoy» stayed in surface position all way. Press spokeswoman with the Norwegian Joint Head Quarters, Major Elisabeth Eikeland tod the Barents Observer that they didn’t know why the Typhoon submarine wasn’t submerged. Norwegian military was monitoring the southbound voyage and is likely also tracking the Russian naval vessel group en route north. «Dmitry Donskoy» is the largest submarine ever built. The 172 m long vessel is powered by two 190 MWh reactors. The vessel is the oldest of the six in the Typhoon class, commissioned in 1981. Three of the other Typhoons are scrapped, while two others are decommissioned, but are still laid-up in reserve in Severodvinsk by the White Sea. Originally, each of the submarines in the Typhoon-class could carry 20 ballistic missiles with a total of 200 nuclear warheads. During the Cold War, the submarines were based in Zapadnaya Litsa, less than 60 kilometres from Russia’s border to Norway.